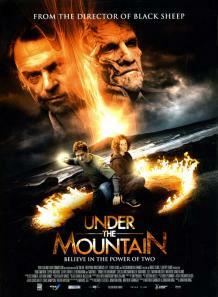 December 24th 2009 - ‘Under The Mountain’ is a beloved 'kidult' book written by Maurice Gee and was made into an also beloved 8 part mini series in New Zealand back in 1981. So it’s taken a long time for it to be finally adapted into a feature length film, and it took one of the current golden boys of the film commission to get the film to the big screen. Jonathan King, son of famous dead historian Michael King, has directed one feature before, the flawed ‘Black Sheep’. That film was well written but I felt the still new to directing, King, struggled to get the story onto the screen and some poor acting choices didn’t help his first film either. This is now his second feature, and even though he has improved, I still felt this film lacked the punch that a more experienced director would have been able to achieve. I ventured into seeing this film not having read the book or having seen the TV series, so I was a blank slate. I really liked the fact it was a higher budget New Zealand film and, from having seen the trailer, had what looked like high production values, which for the most part felt that way while watching the movie. But there were many scenes and sets that just felt a bit cheap and if anything gave the film a very low budget feel. King's directing was better but I still felt he struggled visually with how to tell the story, and again, with some poor acting choices, this film just didn’t live up to what it could have achieved. 6.5 out of 10 from me.